Are gloomy clouds of grief hovering over your spirit? Do you wish to attain higher levels of wisdom? Is trouble looming and you need assistance avoiding it? 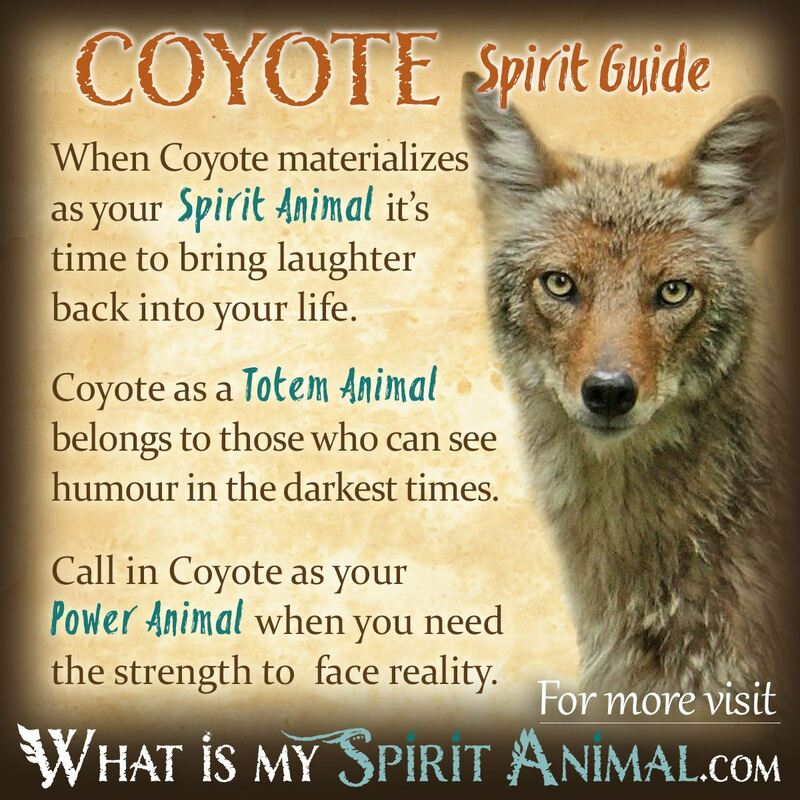 Coyote as a Spirit, Totem, and Power Animal can help! Coyote teaches you how to ease stress, calm the spirit, and adapt to any condition. Delve deeply in Coyote symbolism and meaning to find out how this animal spirit guide can aid, guide, and enlighten you. Coyote symbolism and meaning is incredibly complex. There is nothing about this animal’s teachings that are simple or superficial. The symbolism of the Coyote remains enigmatic, being both a trickster yet also a teacher. Coyote energy is a sign of trouble or good fortune. Most of all, however Coyote arrives in our lives with a smile and a song, acting as a gentle reminder that laughter is truly good medicine. One can be both playful and wise – there is a balance in between. The Coyote is a wild sage whose message comes indirectly. This is not a candid spirit, but one that often resorts to chicanery and jokes to get a point across. Thus, when working with Coyote you must keep on your toes. Coyote will use every opportunity to present a piece of insight through even what appears to be a wholly transparent situation. Coyote challenges us to think about those things that we have pushed down or hidden from others. Very often such matters impact our body, mind, and spirit even unwittingly. Recognizing what you’ve buried and finding coping mechanisms is a step toward wholeness. Coyote also chases away gloomy clouds and negative perspectives by offering the gift of seeing life through the eyes of good humor. If Coyote had a mantra it could well be, “expect the unexpected.” Uncertainty is part of life so you might as well embrace it like the Coyote and release what you cannot control with joy. Coyote as a Spirit Animal appears when we either need to remove our masks or put them on for protection. Coyote also enters the lives of those who have fallen into taking life much too seriously. Learning to laugh at our mistakes and use them as a teachable moment can be incredibly healing and a wonderful coping skill. Coyote may be telling you to be mindful of the risk-reward equation. Sometimes we need to play it safe, and other times take a clever leap of faith into something wholly new and challenging. It’s likely that you are about to embark on a new situation that calls for adaptation. Finally Coyote comes to us in times when our family needs nurturing. Turn your eyes to the home front and determine who needs extra support and what proverbial elephants in the living room you’ve been avoiding. Those born with Coyote as a Totem Animal are wise, light-hearted folk. You have no trouble laughing at life, even your mistakes. As a child you may have been the class clown. As an adult you’ll find that odd happenstance has a way of finding you. Coyote people like to lives simply, which is why you adapt to new things so easily. Trust is very important to you, as is your tribe of family and friends. Coyotes find that life can be both sacred and silly at the same time. You are cunning and sometimes tempted to use your trickster energy for pranks. The key here is making sure such jokes are not vengeful or ill-conceived. Coyote follows the golden rule. In love, you are devoted. Coyotes mate for life and diligently care for their young. Invoke Coyote as a Power Animal when you need to turn your frown upside down. If you never release stress, and only dwell on the negatives, you’ll attract more negativity. Invoke Coyote and let him guide you in making a positive transition – tapping that inner child and learning how to live playfully once more. Another good application for Coyote energy is when you’re facing a new situation that makes you uncomfortable. Coyote shape shifts and transforms with ease. Let him show you how to reclaim your power in this space. Native Americans consider the Coyote a creator, an Ancestor spirit, and a trickster. As a Creator it is said that Coyote shook a blanking in all four of the cardinal directions creating land and water. Some medicine men use Coyote for healing in a special ritual called Coyoteway. This takes several days to complete, during which time Coyote is honored in ritual and prayer. Dreams about Coyotes can be a positive or negative messenger. If the creature is being sneaky that implies someone else is likewise deceiving you. A non-threatening Coyote may indicate that you need to take things less seriously. Loosen up and laugh. Learn more about Coyote Spirit by reading Coyote Dream Meaning on WhatIsMySpiritAnimal.com! In both Japan and China black and white Coyotes (and Foxes) are omens of good and evil, respectively. Japanese stories include references to these creatures having great magic and the ability to shape shift at will. Is there a slecial meaning for white coyote? So a Coyote approached me just this night and stood at the opposite side of the road from me. We met glances and I naturally moved my head around at it, it copied me and then turned back to a park nearby where I live. The whole situation felt unworldy as this is the second time it’s actually happened to me where I’ve seen one and it’s copied what I’ve done (Tilt it’s head or roll it around) and left. What exactly would that mean? I’ve had similar things with foxes and even a wolf before. It’s been absolutely weird that I’ve had a connection with all three in some way or another… however with the Coyote, it was nearly six or seven meters away… is there a bad omen with that? I am interested in what a coydog symbolizes? This is the second time these coy dogs have come to my place of living and the first time gotten into the trash. Tonight they wondered around the yard. I adore them and am blessed to know they are my spirit animal! I have an incredible story concerning a coydog.